Hsiu-Ping (Patrick) Wu is a composer-performer from Taiwan, who recently finished his composition program at Fountain School of Performing Arts, Dalhousie University. 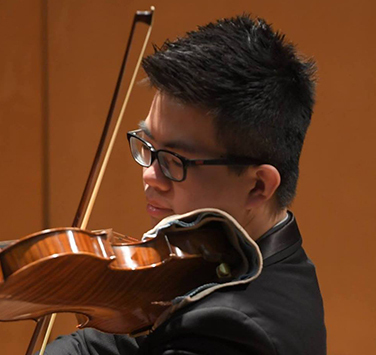 Patrick is now studying violin in his final year with Prof. Leonardo Perez; he has previously studied with violinists Karen Langille, I-Ching Li, Philippe Djokic, and Mark Lee. As well as performing in Canada, Patrick has also participated in festivals such as New York International Music Festival (2015), Evergreen Symphony Orchestra Camp (2016), Scotia Festival of Music (2017/ 2018), and National Taiwan Symphony Orchestra Camp (2017). In 2016, he served as concertmaster of the ESO under the baton of Wen-Chen Chuang in Taiwan. As well as classical music, Patrick is very much influenced by the contemporary music around him; he began studying composition in 2015 with Jérôme Blais and Peter Togni. Since then, his pieces have been premiered in Halifax with pianist Peter Allen (2016), Nocturne: Art at Night Festival (2016/ 2017), with his first film performed by the Society of Dalhousie Students, Open Waters Festival (2016/ 2017), and highSCORE Composition Festival (2017) in Italy. In 2018, Patrick premiered two brand-new compositions at the Zodiac Music Festival & Academy in France, and Uzmah Upbeat Composition Program in Croatia. Patrick’s violin has been sponsored by the Chimei Foundation with a 1924-violin by Carlo Giuseppe Oddone since 2015.